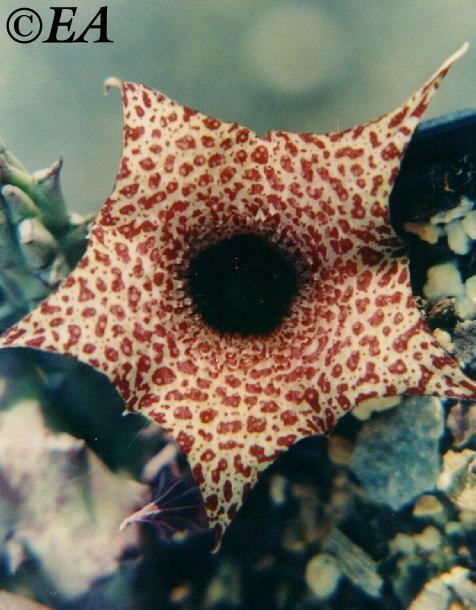 Destribution: Huernia hislopii is found in abundance in Zimbabwe and in one locality in Moçambique (near Umtali). Description: Short 5 sided sub-erect stems (2-3 cm in height). The stems are green to an off-pink colour, slightly segmented with a small white thorn at the tip. Flower: Large intermediate lobes (3mm long), generally reflexed, corolla tube has an inflated base which is constricted at the throat. Dark red cricles appear in the tube, the rest of the flower is creamy and dotted with dark-red spots. Cultivation: Shade, moderate water, frost protection required. min temp 10 C.